Yayyyy! Update your google readers and such…not that I know how to do that! If anyone has insight into how to find a good theme that is easy to customize (I’m no good at this web design thing! ), please let me know. I’ve been trying all day to get the site to look how I want it to! 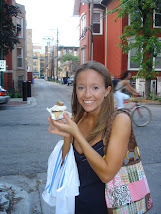 You may notice that I rarely mention my current roommate on the blog. Due to our opposite schedules, I never see her, which is a bit sad because despite the randomness of our meeting (go craigslist! ), we actually have a lot in common and she’s pretty awesome. She likes to cook and even ran a half marathon (her first!) last month, so you can clearly see what we’ve got going for us. This weekend she asked if I wanted to cook something together on Monday (my day off! ), so we did. And kind of went all out. I hope you like your greens! Now for all those weird veggies that you look at in the store but have no clue what to do with. Including: 12 white baby potatoes, two leeks (light green and white parts only! ), five carrots, two turnips, four parsnips, half of a butternut squash, and half a celery root. I admittedly have never had half of these veggies before! For those meat eaters of the blog world, here’s some chicken! Ten chicken legs and thighs, with the skin on. Season with salt and pepper, then cook in a skillet with some oil for 3-4 minutes on each side. Place on a baking sheet and roast for 40 minutes. Once the chicken is removed from the skillet, add one cup chicken stock to the skillet, bring to a boil, then place in a bowl. Just when you thought all the flavors were covered, we’ve got three baking apples and seven ounces vacuum-packed whole peeled chestnuts! Heat some butter in a skillet and brown the apples for about ten minutes…then add the chestnuts! I’ve never had a chestnut before…new adventures! Once everything is done roasting (it takes awhile…), add the brussel sprouts, green beans, snap peas, and apples along with two tablespoons garlic to the giant veggies mix and toss. Then roast for ten more minutes. Now for the fun part…take EVERYTHING (chicken, all veggies, 1/2 cup parsley, stock, and two tablespoons reserved pan juices) and combine. Then stuff the pumpkin!! Roast until “heated through,” about fifteen minutes. Note: over half of the veggies didn’t even come close to fitting in the pumpkin, so we stuffed what we could. I have no clue where Martha got a gigantic pumpkin. Look at all those flavors! Blueberry pie and ice cream! There you have it…an absolutely amazingly ridiculous meal like I’ve never had before. I think it’s fun to try new recipes and eat new foods, especially when you can share it with others! Give it a try! Another successful run today! The weather is so perfect for running…it was in the high 50’s and sunny! I was warm in my long sleeve shirt, so I guess it’s still short sleeve weather. Fine by me. :) I took it easy again today, going for five miles this time! My left calf/quad actually felt a little tight, so I guess I spent too much time stretching my right leg yesterday and not my left leg. I evened it up after my run today, so no worries there. The hardest part about getting back into running after my month off is trying to not get caught up on the pace. My legs can feel that they haven’t ran in a month, and I need to remember that any pace is a good pace as long as it’s pain free! One of my miles was 8:50-ish, and I admit that I did a double take when my garmin beeped. Not that 8:50 is actually slow, but when I’m used to more around eight minute pace, it doesn’t seem quite right. I reminded myself that for my second day back, that’s not too shabby. There will be many more days to run faster…eventually. Time to get ready for work…only having one day off (which is how it works when it’s your weekend to work…we get a random day off the week before and the week after) really doesn’t seem like enough to reenergize! Hurry up, Friday! Stay tuned for the absolutely ridiculously amazing dinner I had last night…you won’t be disappointed! Short but oh so so sweet post! Saturday marked the official one month anniversary of the last time I ran…not exactly something I wanted to celebrate! After sitting around for a little bit today, I decided that I wanted to give running a try. I ran about a block and the pain wasn’t too terrible, and I remember the sports medicine doc saying that sometimes IT Band Syndrome is a little better after a warm up. So I kept going. My leg loosened up after about a quarter mile, and away I went! While it wasn’t perfect, my stride actually resembled something of a running gait, which it definitely hadn’t in recent times. Yay! I told myself to take it slow and not push the pace at all…just run. It felt great! I came home and stretched stretched stretched…and iced! My leg feels pretty good. :) Hopefully I’ll be back tomorrow!! Iliotibial Band Syndrome for the win! As you can (hopefully) tell, the IT band is kind of important in running and is a pretty common injury. The IT band functions to help stabilize the leg during “knee-bending activities” (aka running), so with repetitive motions, it can become irritated. The friction created between the IT band and the underlying anatomy at the outer knee (the lateral femoral condyle, if you really want to know…the outside bony part on the bottom of your femur) can result in pain and inflammation. Fantastic. Rest! Ahhh, every runner’s worst nightmare. Change the direction you run! Run on both sides of the street, run both directions on the track. Apply heat to the area prior to exercising, apply ice after exercise. So what’s the main treatment for IT Band Syndrome? Figuring out what the cause of it is and removing that factor. I’m not necessarily sure what caused mine to flare up. I’ve worn the same shoes since I was 17 (that’s eight years!) and I replace them at the proper intervals. I run mostly on a trail which is flat…even if it’s not, I run out and back on the same side (mostly), so I’d be mixing it up. I increased my mileage properly, and I’ve successfully trained for marathons before so I know my body can handle the volume. One activity I don’t do religiously is stretch. When my mileage creeps up, less time is available for stretching and strength training, and they tend to fall by the wayside in my life. Perhaps my IT band is just tight and I need to do some stretches to loosen it up. I’m not flexible by any means, so hopefully some flexibility work will help with the pain. I’ve certainly done the resting part…I haven’t run in a month, and I took the first week completely off…no biking or anything. I’m hoping that by stretching and continuing to ice, I’ll be able to run again soon. I would still like to run the Philadelphia Marathon, although at this point I realize I won’t be setting any records! Hopefully this post was at least somewhat informative! I’m hoping that I will be able to implement some stretching that will allow me to run again…stay tuned! It’s a rainy day here in Pennsylvania…that doesn’t bode very well for my biking adventures! I’m much more wimpy when it comes to biking than running…I can run through most anything, but biking isn’t quite the same. I still have a little bit of a sniffle, so I won’t chance it. I’m going to the sports medicine doctor tomorrow, so hopefully we’ll sort out this whole not-running thing. It’s been almost a month! Yikes. Come up with something similar to “Nurse on the Run” for the URL? Such as: runnerRN.com. I feel that could be confusing. Just do "susanruns.com”…Right to the point, if nothing else. I ask you, blog world, to help with my little dilemma! It’s nothing earth-shattering, but I know some of you have made the switch to your own domain and may have some insight. Let me know! Add moon bounces to the shoes!! When I was at Space Camp (nerd alert! ), we all had a chance to be in the 1/6th gravity chair simulator, where you could bounce around like you were on the moon with 1/6th of the gravity of the Earth. 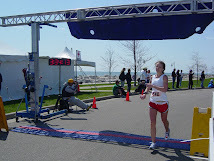 How fun would marathoning be if you could moon bounce your way to the finish line?? Yes, I went to Space Camp when I was in the sixth grade. It was AWESOME. I saw a shuttle launch and got to go on all these cool simulators. You’re jealous, admit it. (The Rocket Scientist also went to Space Camp…add that to the cuteness factor.) Moving on. Nothing excites me more than a package in the mail!! Look at all that good stuff!! Brooks stuff…and a note from Frayed Laces herself! Note from Frayed Laces…how cool! A Brooks book…Handmade by Frayed Laces from an old Brooks shoe box. I love it! Recovery and Injury info and prevention…definitely timely. “Pain Relieving Plaster”…also Japanese. Looks like an icy-hot band-aid. RECOVERY SOCKS!! I kept putting off buying them…Soooo excited! I may or may not have put them on right away (okay, see below for photo evidence), and I’m definitely wearing them tomorrow and work. Yes!! Hand wipes! You never know when you’ll need some on a long run post-bathroom. Power Bar for pre-long run energy…can you believe I’ve never actually had a Power Bar before? I’ll have to give it a try! “Pocari Sweat” = Japanese Gatorade…we’ll have to see how it compares. Lava Energy Gel…maybe this will be a gel I can actually swallow?? This made my day!! I was so excited win the Frayed Laces Special and check out the goodies. I love it…Thank you so much Frayed Laces! Be sure to head over and check out her blog…you won’t be disappointed! Alright, I’m off! Thanks again FL! Being a faithful reader of Sarah’s blog, I have come to love Martha recipes as Sarah cooks her way through one of Martha’s cookbooks. When in a bind (or at the Rocket Scientist’s and therefore sans cookbooks), I hit up the Martha Stewart Food website for some ideas. The recipes are usually pretty quick and fairly healthy, so they’re right up my alley! Yesterday prior to grocery shopping, I selected Mediterranean Chicken as my meal of choice for the week. (Cooking for one for me means making one meal to last almost all week!). I admittedly set off the smoke detectors while cooking…I guess the olive oil reached it’s smoke point! Oops! I opened all the windows, which makes it a little chilly in here, but that’s what sweatshirts are for. :) I really like the Kashi pilaf…it was easy to make (threw it in the rice cooker!) and has a nice nutty flavor. The chicken is quite tasty…anything with olives is made infinitely better! I biked in Princeton for about an hour and a half yesterday…my garmin’s battery was dead so I have no clue how far I went. Back to the old days of just using a watch! Although I didn’t even have a watch, so I just went by the time on my cell phone. A little more relaxed environment than staring at the data on my wrist. The Rocket Scientist ran seventeen miles while I was biking…his training is going well, and we’re hoping he qualifies for Boston in November so we can run both run Boston in April. He finished the Delaware Marathon in 3:13 this year, so he’s close! Fingers crossed. I’m also heading to a sports medicine doctor on Friday, so hopefully I can at least get some direction in what’s going on with my leg. The aforementioned Sarah is having a giveaway! She’s a planner galore and wants to assist you in your future planning. Check it out! It’s Sunday night…where did this weekend go?? I know exactly where…Philly! The Rocket Scientist’s sister got married this weekend in downtown Philly, and it was quite the site to be seen! Lucky for you, I took lots of pictures. :) This was our second wedding in three weeks (first can be viewed here! ), so it was interesting to see the differences between the two. Here we are, a photographic journey into my weekend! I was actually supposed to work on Friday night, therefore missing the rehearsal and rehearsal dinner…I was just going to head down on Saturday for the actual ceremony and ensuing festivities. When I showed up at work on Friday, I jokingly said that I would go home if they didn’t need me, but they hadn’t heard about staffing yet. We got the word on how many nurses we needed…and then another nurse showed up! She had been called off but didn’t have her cell phone with her, so she headed to work anyway. Since we had an extra nurse, they said we could battle it out about who would stay and who would go. The other nurse remembered that I had something else to do tonight, so she said she would stay. Yay! Night off. :) I raced back home to shower and pack and head down to Philly. I ended up missing the actual rehearsal, but I made it in plenty of time for the rehearsal dinner! It’s no Chicago, but I guess it works. Lights of Vesper from the deck. University of Pennsylvania’s boat house. Hanging out in the window. Rocket Scientist sporting his mom’s lovely leopard print jacket. The Pendulum that demonstrated that the Earth rotates…every 25 minutes it knocks off a different peg. Touring the giant walk-through heart! Learning about arteries and blood flow…keep your heart healthy! Rocky Road Brownie!!! Normally I hate nuts in my brownies, but this was tasty. Saturday night was the big night! Since it was at a museum, it was a rather late event. The actual ceremony was in the Planetarium, so of course the crowds had to clear out before we could head in! Pictures were first taken outside…luckily the sun came out in the afternoon for some pretty pictures. Rocket Scientist’s family with the bride and groom. Three other wedding parties were also taking pictures. Woo! Thanks to my friend for actually picking a bridesmaid dress I could wear again! View of City Hall (and Ben!) from Logan Square. The reception was in the main hall…no joke, we ate at the feet of Ben Franklin. The salad was AMAZING. I had Sea Bass for dinner…tasty tasty! Definitely some of the best wedding food I’ve ever had…I usually feel like it leaves something to be desired, but this was awesome. Not going to lie…I wasn’t too impressed with the cake. Okay…LET THE AWESOME PICTURES BEGIN. I told you he’s nerdy…the socks/glasses were for the wedding pictures…each groomsman had a different color! The Rocket Scientist found another scientist! The heart is an awesome muscle…so I flexed mine! Okay…that’s actually kind of cute. It was a really fun weekend, filled with lots of good food! Dancing was a little limited at the reception…everything was kind of broken up so it didn’t really get started. Annnnd we got pulled away for lots and lots of pictures. But that’s okay, fun was had by all. It was one of the fancier weddings that I’ve been to, and I can’t say I’ll ever see anyone get married in the Franklin Institute again! I hope everyone else has glorious weekends as well. I'm a burn unit nurse living and working in New York City. Above all, I love to run. A Girl Just Wants To Run (and have fun)! Get out there and run already! Reminder: Update your RSS feed links! 9/2013 – Where to find me now?